Come and explore your creativity at The Corn Loft in a homely, friendly atmosphere. We promise a warm welcome and our expert tutors, attractive surroundings and home cooking will all contribute to making your learning experience enjoyable. We offer art workshops, creative writing courses, and personal development programmes. Resident Counsellor Rita Lett B.Sc.MIACP, EAC offers Counselling & Psychotherapy to individuals, family and children, couples or groups. Rita also offers Art Therapy which is another way of expressing inner thoughts and feelings. For individuals who seek a personalised approach to developing their potential we offer one-to-one Coaching sessions with Certified Life & Business Coach Heather Blackmore. This year we invited P.J. Lynch, a wonderful illustrator and portrait painter to hold a workshop at the Corn Loft. 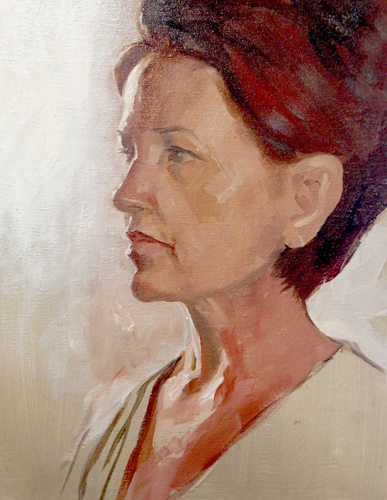 The "Portrait in Oils" workshop on a beautiful summers day in June was a huge success and was well attended which is not surprising as P.J is a renowned artist. He has won many awards including the Mother Goose Award, the Christopher Medal three times, and the prestigious Kate Greenaway Medal on two occasions , first for "The Christmas Miracle of Jonathan Toomey" by Susan Wojciechowski, and again for “When "Jessie Came Across the Sea”" by Amy Hest. "The Christmas Miracle of Jonathan Toomey"” has sold more than a million copies in the United States alone, and has recently been made into a motion picture starring Tom Berenger and Joely Richardson. In recent years PJ has been commissioned to design posters for Opera Ireland and the Abbey Theatre. He has also designed several sets of stamps for An Post (the Irish Postal service), including four Christmas issues. In 2006 PJ completed work on two large scale murals in oils on the theme of “"Gulliver’s Travel's"” for the new Cavan County Library. PJ Lynch has lectured on his own work, and on Art and Illustration at the National Gallery of Ireland, The National Library of Ireland and at the National Print Museum of Ireland, as well as at numerous conferences and colleges across the U.S.